We were talking in art class last week about art shows with "themes". A couple women had been doing bird paintings, and we talked about maybe do a show that was all bird paintings. And someone said that the Turtle Back Zoo had an art gallery, and maybe we could have a show there. We all smiled at the idea and said we would have to paint pictures of birds and/or animals. I call this Penguins in Progress and I don't think I'm actually done with it yet. 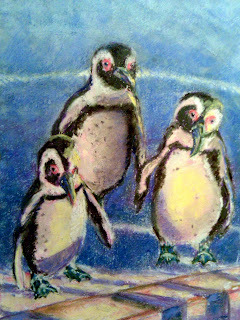 I'm still not satisfied with the background, and not sure I'm fully satisfied with the penguins themselves. But this is the point I reached last night so decided to post it anyway - and will see where I go from here.